Emma Pooley will use the ?special? handlebars that helped her on her way to a silver medal in the Olympic Games time trial when she goes for gold in the World Championships later today. The 25-year-old was British Cycling?s secret weapon in Beijing. Months of planning, including work on her time trialling position paid off with a medal. Part of Project Pooley was a new set of handlebars which combined the aerodynamics of a triathlon-style handlebar with traditional brake lever hoods to enable her to climb in her favoured position. It meant she was comfortable and able to maximise her power when out of the saddle, but could still get into a low-profile position on the flatter sections. Pooley will use the same bars again in the women?s time trial at the Worlds in Varese, Italy, although there will be one small change. Instead of STI gear shifters on the brake levers, she will have shifters on the end of the tri bars. As women?s coach Julian Winn pointed out: ?It?s more suitable on this course to have the gear shifters on the tri bars because there isn?t as much climbing. ?The handlebars are perfect for Emma. They allow her to climb in her natural style but also to be aerodynamic on the flatter sections.? 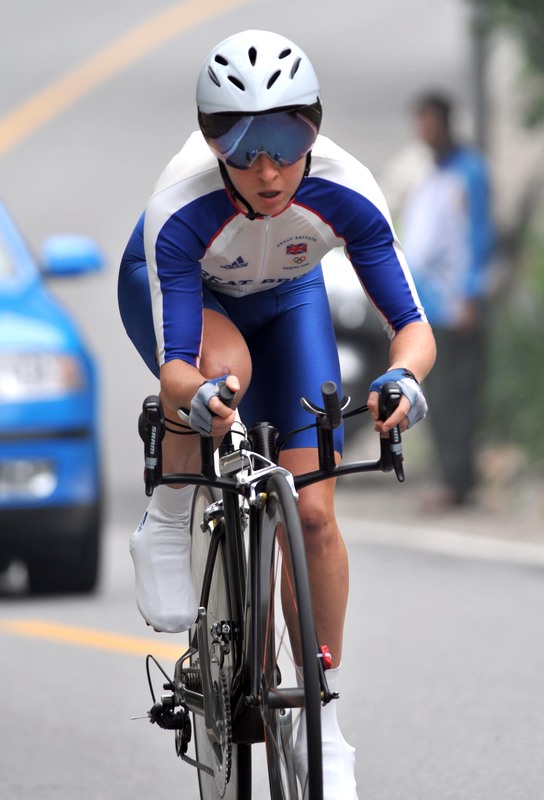 Pooley is the ninth from last starter in the women?s time trial at 2.08pm UK time. Sharon Laws goes out earlier at 1.20pm. The Olympic champion, Kristin Armstrong of the USA, goes out last, at 2.24pm. Winn added: ?Both the girls are in really good shape. Sharon is off quite early so she can go out there and give it her very best and see where it gets her. ?Emma is relaxed and won?t want a barrage of information from the car. She prefers encouragement not split times.? Nicole Cooke may choose to wear a skinsuit in Sunday’s road race, just as she did when she won at the Olympic Games last month. Pooley?s specially-designed time trial bars have standard brake levers positioned in the same way as on her road bike so she can climb most effectively. This is in contrast to many tri-bar designs which are flatter which, while more aerodynamic, do not allow the rider to get out of the saddle and climb in a familiar position. Pooley used the bars for the first time in Beijing and will do so again in Varese.